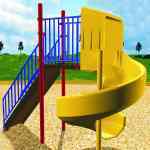 Playground equipment for commercial settings is available here: freestanding commercial slides, which bring slide fun to your playground in stand-alone structures. 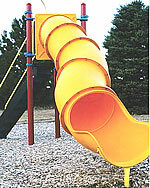 This playground equipment offers kids the timeless playground concept: climb up, make some noise, and slide back down. This playground equipment is sturdy, reliable, and great value for the money. When you buy our playground equipment items, you receive complete support from us after purchase. If you’re looking for recycled equipment, you should know that the steel used in these structures is generally made from 50% recycled steel. 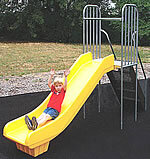 Call us with any questions TOLL FREE at 877-840-0707 about these great playground slide structures. We also offer financing options for commercial playground structures from $5,000 up to $150,000! Please note that prices shown only cover the cost of the playground equipment, not shipping or installation.